The user interface has received a complete overhaul and appears much more modern with the same dark theme as found in our range of plug-ins. All graphical elements are vector based and scale nicely on high DPI displays. The spectral editing mode switches the normal waveform view to a spectrogram where you can make selections in time and frequency. Subsequent processing is applied only to this selection and allows you to edit out isolated problems in the spectrogram. A specialized Retouch tool is available that attenuates noise using information from a reference signal in the surrounding “clean” areas. Loudness metering and normalization according to EBU R-128 and ITU-R BS.1770 are now integrated. These recommendations are gaining momentum and more and more broadcasters and streaming platforms require loudness compliance. Acoustica can now automatically de-click splice points. Previously, care had to be taken to avoid discontinuities during editing. The new Automatic Splice De-click option ensures that clicks don’t occur at the splice points. Acoustica now supports VST3 and AU (Mac only) plug-ins in addition to VST. The DirectX support has been discontinued. The integrated tools for dynamic processing have been re-implemented for better audio quality and an improved user interface. Dynamics is a combined compressor, expander and gate. Harmonic distortions are kept to a minimum due to smart look-ahead and optional oversampling improves the quality further. The user interface is highly intuitive and graphical as you would expect from Acon Digital. Multiband Dynamics (Premium Edition only) is the multiband companion to Dynamics. It allows separate dynamic processing in four bands with variable cross-over frequencies and continuously adjustable slopes from 6 to 96 dB / octave. Limit is a brickwall limiter with an integrated pre-compression stage. Harmonic distortions are kept to a minimum due to smart look-ahead and optional oversampling improves the quality further. Acoustica Premium Edition now includes the award winning processing tools from Restoration Suite 1.8. The Standard Edition contains the same tools except for a light version of DeNoise without adaptive filtering and with fewer parameter settings. Phono Filter, the integrated emphasis and de-emphasis filter now uses a much more accurate filtering technique that evaluates the amplitude response of the analog filters directly. Advanced users can specify time constants and presets for RIAA, vintage equipment and DAT / CD emphasis are included. 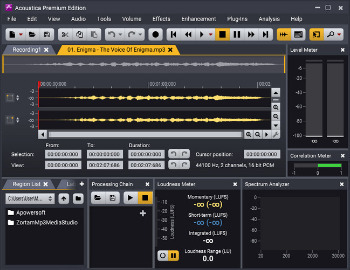 Vitalize replaces the old High Frequency Synthesis tool and comes with an improved algorithm and better user interface. Acon Digital Equalize is seamlessly integrated in the Premium Edition and a light version with only the minimum phase response is included in the Standard Edition. Acon Digital Verberate is seamlessly integrated in the Premium Edition and a light version with a limited parameter set is available in the Standard Edition. Dither is a new separate dithering tool with novel and flexible noise shaping options. The Sample Rate Conversion (SRC) algorithm has been significantly improved. All other audio processor have been re-implemented and received a new and more polished user interface.